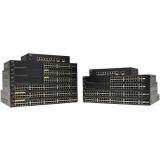 The CISCO 250 series is the NEXT generation of affordable smart switches that combine powerful network performance and reliability with the essential network management features you need for a solid business network. These expandable gigabit Ethernet switches provide basic management, security, and quality of Service (QoS) features beyond those of an unmanaged or consumer grade switch, at a lower cost than managed switches. And with an easy-to-use web user interface, auto smart ports, and flexible power over Ethernet plus capability, you can deploy and configure a complete business network in minutes.